I'm on my way to Australia to attend the Consilium conference. I'll be on a panel speaking "in praise of contrary opinion". If you are in Sydney, we'll be reprising this discussion on the 25th in a public meeting. On the 26th, I'll be on an excellent panel with Cassandra Wilkinson and Julie Novak to talk about government snooping and the march of puritanism. That event, organised by My Choice Australia, is also in Sydney and will, I hope, be followed by some binge-drinking. I'll also be paying a flying visit to Auckland to talk about sin taxes at the New Zealand Food and Grocery Council, but that is, I think, restricted to members of that organisation. 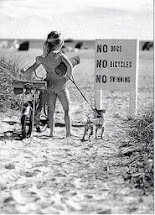 I've had a few things to say about nanny state lunacy on the other side of world in recent years. The cancer of public health totalitarianism seems to be partially in remission in Australia since Gillard was kicked out, but it will be interesting to see things with my own eyes. It's been eight years since I visited either country. I'll be back at the end of the month when normal service will be resumed on this blog. 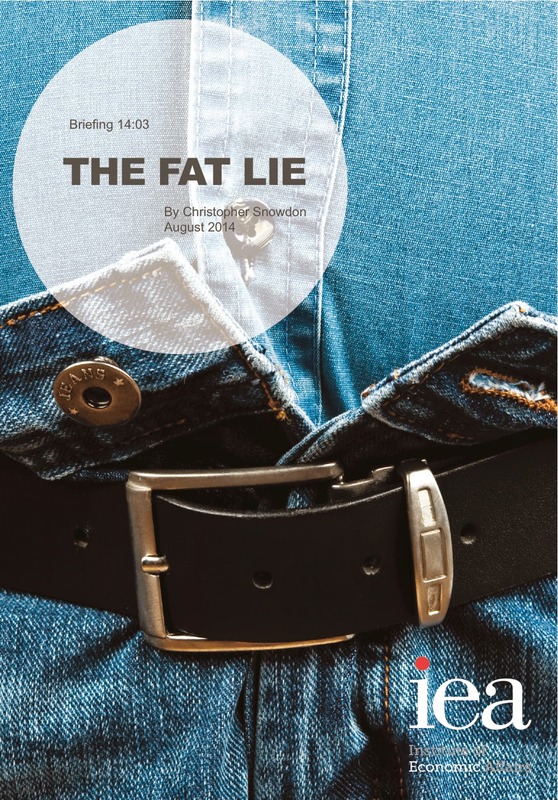 Yesterday, the IEA published my latest report—The Fat Lie—which presents some of the evidence mentioned previously on this blog related to calorie consumption and obesity. The following is a summary of some of the main points, but please read the whole report which can be downloaded free of charge here. Obesity prevalence has increased sharply in Britain since the 1970s. Many public health campaigners portray Britain’s obesity ‘epidemic’ as being caused by the increased availability of high calorie foods, sugary drinks and larger servings in restaurants. This view has been reflected in television programmes such as The Men Who Made Us Fat (BBC), which focus on the supposed rise in calorie consumption while paying little attention to the other side of the equation: physical activity. 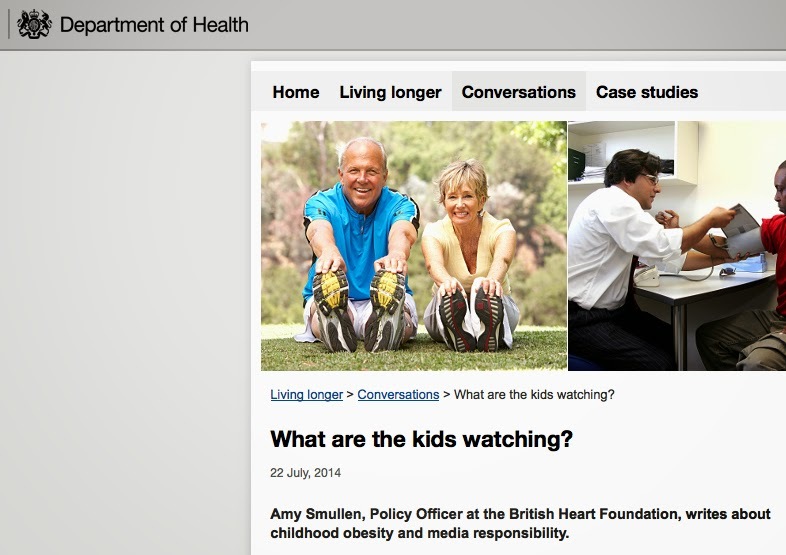 Some campaigners explicitly dismiss physical activity as a factor. For example, Aseem Malhotra, science director of Action on Sugar, says that ‘it’s time to bust the myth of physical activity and obesity’. Today, the IEA has released a briefing paper that demonstrates that this conventional wisdom has no basis in fact. If people are ‘being bombarded every day by the food industry to consume more and more food’, as some claim, then the industry has failed. Consumption of calories - and of sugar and fat - has fallen significantly while obesity rates have risen. The Department for Environment, Food and Rural Affairs (DEFRA) has carried out annual surveys of the British diet since 1974. These surveys are based on diet diaries compiled by a cross-section of the public and are supported by till receipts (DEFRA, 2013). 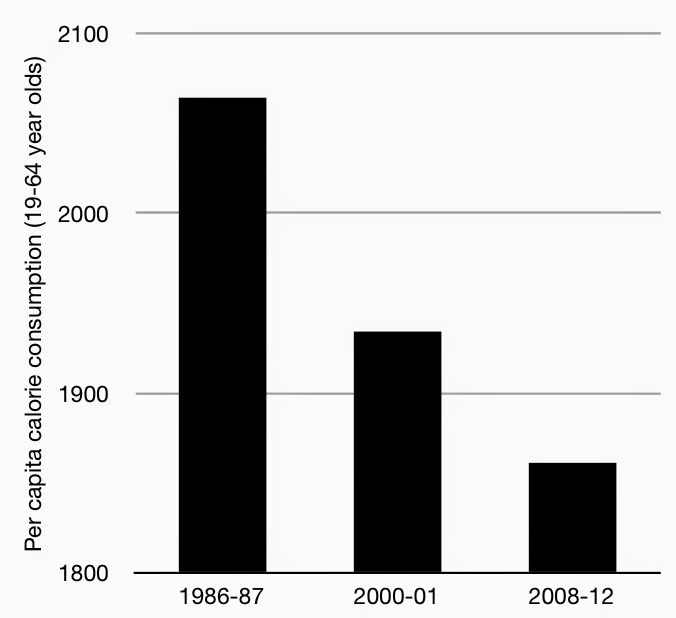 Shown in the graph below, these data indicate a significant decline in daily per capita calorie consumption in the last forty years, from 2,534 in 1974 to 1,990 in 2012. This represents a decline in energy consumption of 21.5 per cent. This is corroborated by the National Diet and Nutrition Survey (NDNS) which began in the 1990s, the results of which can be compared to the Dietary and Nutritional Survey of British Adults which holds data for 1986/87. These surveys collect data for food and drink consumed inside and outside the home. Shown below, they indicate that average calorie consumption has fallen by 9.8 per cent for 19-64 year olds since 1986/87. Both datasets also show a decline in per capita consumption of carbohydrates (including sugar) and fat (including saturated fat). It is clear that average body weight has been rising for decades while average calorie consumption has been declining. 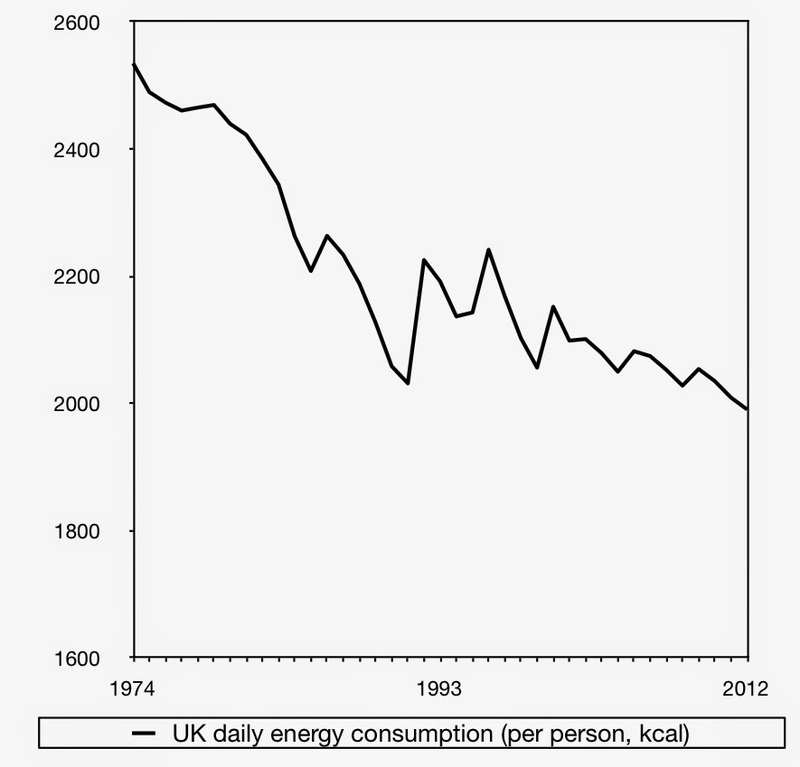 Assuming that the laws of thermodynamics are correct, there can be only one explanation for this: Britons are, on average, burning fewer calories than we used to. This should not be surprising. The transition from manual labour to office work saw jobs in agriculture decline from eleven to two per cent of employment in the twentieth century while manufacturing jobs declined from 28 to 14 per cent of employment. Britons are walking less (from 255 miles per year in 1976 to 179 miles in 2010) and cycling less (from 51 miles per year in 1976 to 42 miles in 2010). Only 18 per cent of adults report doing any moderate or vigorous physical activity at work while 63 per cent never climb stairs at work and 40 per cent spend no time walking at work. Outside of work, 63 per cent report spending less than ten minutes a day walking and 53 per cent do no sports or exercise whatsoever. Add to this the ubiquity of labour-saving devices and it is clear that Britons today have less need, and fewer opportunities, for physical activity both in the workplace and at home. Firstly, there is a tendency to import narratives from the USA where, in contrast to the UK, calorie consumption rose in line with obesity rates for many years. This dual trend had come to an end by 1990, however, and the role of chronic physical inactivity is beginning to be acknowledged as the driver of rising obesity in the years since. Secondly, the food supply is a more inviting target for health campaigners than the sedentary lifestyles of the general public. A war against ‘Big Food’ requires no stigmatisation of individuals (other than the individuals who work in the food industry) and there are a readymade set of policies available which have been tried and tested in the campaigns against tobacco and alcohol. Instigating such a war, however, requires the public to believe that food companies have acted unscrupulously by stuffing unwitting consumers full of calories, forcing large portions upon them and spiking their meals with sugar and fat. The data shown in this paper are clearly not helpful to that narrative. Such is the sensitivity of the public health lobby to this sort of information that when two researchers published a paper showing that sugar consumption had been declining in Australia for thirty years while obesity had been rising, they were branded ‘a menace to public health’ and investigated for scientific misconduct. They have since been exonerated, but the title of their study - ‘The Australian Paradox’ - highlights how deeply rooted is the belief that obesity can only be the result of increased sugar and/or calorie consumption at the population level. As the evidence from the UK - and, in recent times, the USA - shows, it is no paradox at all. Reposted from the Institute of Economic Affairs. See also Tim Worstall and James Dellingpole on this topic. I went on Channel 4 News to talk about this report (you can watch the interview here). I confess to getting rather irritated half way through, which I regret because it doesn't go down well with viewers, but I had due cause. I had expected that whoever I was up against would say something along the lines of "OK, people are eating fewer calories but they're still eating too many calories considering their sedentary lifestyle". Then we could argue about policy. I wasn't expecting somebody to flat out deny that calorie consumption has fallen at all, let alone insist—without a shred of evidence—that it has actually risen. Measuring the diet of the nation is not an exact science. Researchers rely on individuals keeping track of what they eat over a period of several days and it is well known that people tend to under-report the amount of food they consume due to a desire to deceive or - more commonly - a tendency to forget (over-reporting is also possible, though less common). The alternative method of keeping till receipts to check what food has been purchased is also problematic because some food is thrown away. Researchers are well aware of these issues and have ways of testing the degree of under-reporting, notably with urine tests using ‘doubly labelled water’ which show how much energy a person has expended (and, therefore, how much energy a person of steady weight has consumed). Nevertheless, it is believed that Britons throw away about 10-20 per cent of the food they buy and under- report how much they eat by around 20 to 40 per cent (WRAP, 2013; Macdiarmid and Blundell, 1998). When studying dietary trends over time the question is not whether people under-report but the extent to which under-reporting has changed over the years, if at all. Women and the obese are most likely to under-report and whilst the proportion of women in the population has remained stable, the proportion of obese people has clearly increased. It is therefore possible that more obesity has led to more under-reporting, but it is very unlikely that the population has become so forgetful and dishonest that the large, steady and virtually uninterrupted decline in calorie consumption reported in successive studies can be explained by misreporting alone. So there is no doubt that people misreport. The only question is whether they systematically misreport far, far more today than ten, twenty or thirty years ago. I can find no evidence that they do and the other sources of evidence, such as food purchases, do not suggest otherwise. As I say in the quote above, food purchase data are not perfect either, because people throw away some food, but it defies common sense to believe that people throw away less food today than they did during the three day week or the winter of discontent. Having knocked the evidence, Lean then dismissed it completely. Indeed, he said that the reality is the polar opposite of what the evidence shows. It's a common tactic with some keyboard warriors and some of the weaker industry lobbyists—skim a paper, look for the limitations, and then claim that the mere acknowledgement of limitations renders the whole paper worthless. Having dismissed the evidence, insert your own subjective opinions as if they were fact. Never mind that the vast majority of epidemiological evidence—including virtually all evidence on nutrition and cancer—is based on self-reporting and, therefore, is subject to misreporting. Firstly, there is a tendency to import narratives from the USA where, in contrast to the UK, calorie consumption rose in line with obesity rates for many years. Our findings do not support the popular notion that the rise in obesity in the U.S. can be attributed primarily to sustained increases over time in the average daily caloric intake of Americans... Average daily caloric intake did not change significantly [between 1988 and 2010]. BMI and waist circumference trends were associated with physical activity level but not caloric intake. Lean's policy of point blank refusal to accept any of the evidence from DEFRA, the British Heart Foundation, the Department of Health, the Institute of Fiscal Studies and the Office for National Statistics turned the discussion into a question of trust—who do you trust: the professor or the increasingly irate free market think tanker? Obviously, the average viewer has no inclination to dig into the data so is going to side with the professor. Krishnan Guru-Murthy helped him out by ending the interview with the tiresome question of whether 'Big Food' funded the IEA report. They didn't, of course. Readers of my books, articles and blog posts over the last five years know which topics spark my interest and I'm lucky enough to be able to write about more or less anything I like within the field of public health policy at the IEA. I don't need any suggestions from commercial interests. As for whether 'Big Food' funds the IEA at all, I honestly don't know and I honestly don't care. I don't really know which companies even make up 'the food industry' but it must be a very broad church (I'm from a long line of farmers so I guess I have 'links' with 'the food industry'). The IEA has always had a policy of donor confidentiality so I wouldn't say who funds it even I knew, which I usually don't. But I'm quite happy to say, as I did in this interview, that people are welcome to assume that we are funded by x if that means that we can move on to talking about the issue at hand. An appeal to authority and a little innuendo about funding goes a long way with the average couch potato—probably more so on Channel 4 News than on most programmes—so I don't doubt that Mike Lean won the debate in many people's eyes. Hey, ho. Hopefully some people read the report regardless. The second part of the current plain packaging meta-lie is that "customs and excise data shows [sic] a fall of 3.4% in tobacco sales by volume in the first year of standardised packaging" (Public Health England). Public Health England gives this webpage from the Australian Department of Health as the source for the claim that sales fell by 3.4 per cent in the first year (ie. December 2012-November 2013). That page says that the treasury has "advised that tobacco clearances (including excise and customs duty) fell by 3.4% in 2013 relative to 2012", but it provides no source and there is no trace of the treasury making such a statement. We might be tempted to take this claim on trust were it not for the fact that the government has produced detailed figures on tobacco sales. They are published by the Australian Bureau of Statistics and can be seen here (table 8). Whichever of the two datasets you use, three things are clear. Firstly, tobacco sales did not fall by 3.4 per cent in the first year of plain packaging. Secondly, the decline in tobacco sales was considerably smaller in the first year of plain packaging than in the preceding years. Thirdly, a decline of 3.4 per cent would not have been unusual even if it had occurred in the first year of plain packaging (the average decline in the previous three periods was 4.3 per cent). But it didn't so it doesn't matter. You may have noticed that both sets of figures show a 3.4 per cent decline in tobacco sales in the year before plain packaging came in, so perhaps that is the source of the error. I won't rule out deliberate deceit, but routine incompetence is a usually the best explanation for government misinformation. I can't say the same about those who spread this, and other, lies about the alleged impact of plain packaging. They are probably conscious, deliberate liars. They've been doing it for years. In recent weeks the various dodgy claims made by plain packaging campaigners have coalesced into a single meta-lie which, I suspect, will now be repeated again and again. The meta-lie has two components. 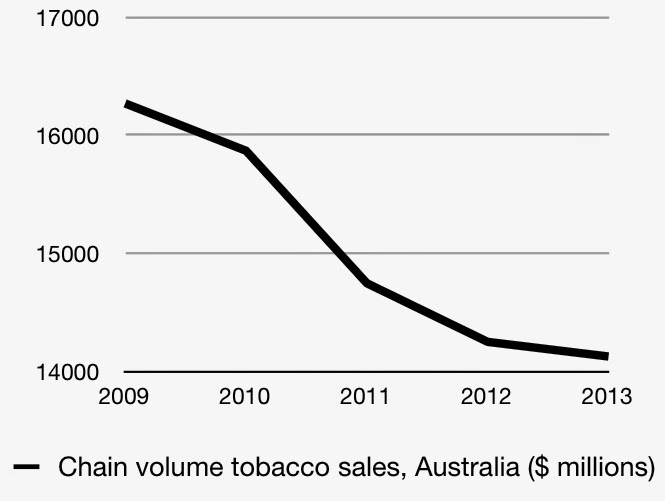 Firstly, that Australia has seen the biggest ever decline in smoking prevalence since plain packaging was introduced. Secondly, that tobacco sales fell by 3.4 per cent in Australia in the first year of plain packaging (with the implication that this is an unusually large drop). In Australia, official data is already demonstrating the impact. Its latest national triennial survey shows the fastest decline in smoking rates in over 20 years, and customs and excise data shows a fall of 3.4% in tobacco sales by volume in the first year of standardised packaging... According to the latest official national survey of tobacco use, the daily smoking rate fell markedly from 15.1% to 12.8% between 2010 and 2013 – a record 15.2% decline. Latest research results from Australia on its standardised packaging of tobacco products are very encouraging. Official data from its latest national survey show the fastest decline in smoking rates in over 20 years with an 11 per cent relative reduction in the prevalence of smoking. Customs and excise data in the same survey show a fall of 3.4 per cent in tobacco sales by volume in the first year of the legislation. Let's take the claim about smoking prevalence first. This contains a lie within a lie. The figures that campaigners are referring to compare 2010 with 2013. Plain packaging was only introduced in December 2012 so anything that happened in two-thirds of that period cannot possibly be attributed to olive green fag packets. Moreover, there was a whopping 25 per cent tax hike on tobacco in 2010 which the government predicted would reduce the number of smokers "in the order of 2 to 3 per cent, or around 87,000 Australians." Using two data points three years apart when plain packaging wasn't in place for most of the period in question is obviously a poor method of assessing the impact of the policy. We do have data that shows annual changes in smoking prevalence, but plain pack campaigners ignore it because it clearly doesn't support the claim they want to make. Leaving all that aside, the claim about smoking prevalence doesn't stand up even on its own terms. 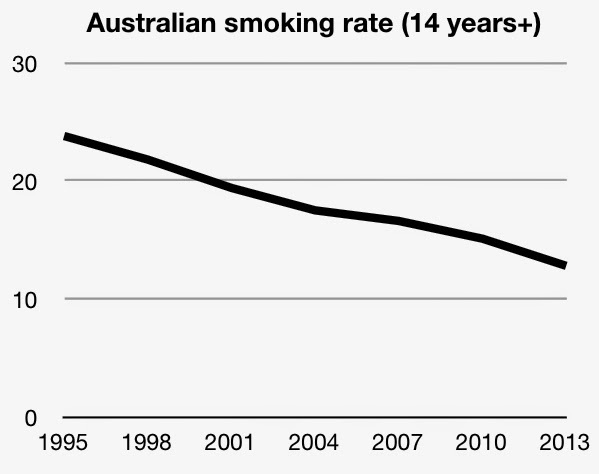 The graph below shows smoking prevalence in Australia since 1995 (in three year increments). Anyone whose job does not depend on not seeing things can see that there has been a steady, longterm decline in the smoking rate. Prevalence fell in every three year period and did so consistently and predictably within a narrow range of 0.9-2.4 percentage points. The biggest decline in this period was not—as campaigners are claiming—between 2010 and 2013 (2.3%), but between 1998 and 2001 (2.4%). 2010-13 did not see the biggest decline in smoking rates since records began (as Martin Dockrell claimed on the radio recently). It was not even the biggest decline in the last fifteen years. So why do they say it was? Simon Chapman seems to be the source of this particular bit of spin. He's keen to focus on the percentage differences between the percentages rather than look at the decline amongst the whole population. Therefore, he's looked at the percentage drop from 15.1% to 12.8% (which is 15.5%) and decided that this is the only number worth talking about. His method has the effect of downgrading what was genuinely the biggest decline in the time series that occurred between 1998 and 2001 (21.8% to 19.4% = 11.0%). To see why this is a statistical trick, consider the graph below which shows a constant decline of 5 units from 50 to 0. The decline is completely straight and linear, but if you measured it using Chapman's method you would get the impression that the decline speeds up rapidly and exponentially (see the percentage figures on the horizontal axis). In the early stages of the decline, the percentage drop is quite small (10%, 11.1% etc. ), but as the numbers are diminished the same drop leads to much bigger declines in relative terms, ultimately ending in declines of 50% and 100%. Every step down represents the biggest ever decline up to that time even though the drop is always exactly the same. 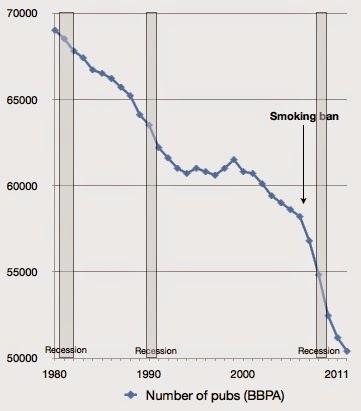 Therefore, if the number of smokers is dwindling year-on-year (as it is in most Western countries) and there is a constant and steady decline in the smoking rate, it is a mathematical inevitably that you will keep seeing a record decline if you measure it as Chapman does even if the rate of decline of smoking in the population does not accelerate. Of course, the smoking rate does not fall by exactly the same amount every year so it is not a certainty that records will always be broken, but so long as the decline is roughly constant the probability of a record being broken rises as the numbers get smaller. This is not the way the data are normally looked at, nor is it the way they should be looked at. Chapman resorts to this tactic because it helps disguise the simple fact that the smoking rate has been falling a steady but pedestrian pace for many years and has continued to fall at the same pace since 2010. 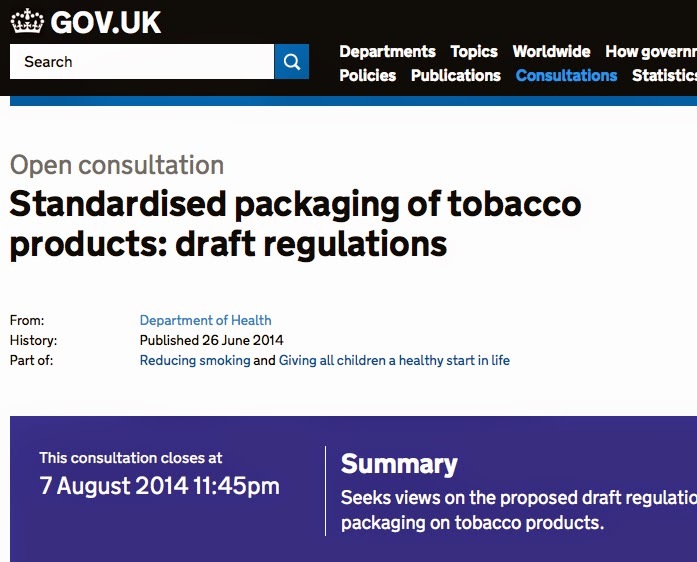 Plain packaging wasn't introduced in 2010 or 2011. It was introduced in December 2012, so the question of whether there was a record drop in the smoking rate between 2010 and 2013 is academic so far as that policy goes. Nevertheless, for the record, there wasn't. This story didn't get much play in the mainstream media but it tells you everything you need to know about the public health racket, from the headline down. Yeah, that's the spirit. If people don't agree with you, force them. Promoting products such [as] snacks, soft drinks and confectionery could soon become a thing of the past, according to leaked details from a Department of Health (DoH) meeting. Susan Jebb, who chairs the food network of the DoH’s Public Health Responsibility Deal, warned at a meeting earlier this year that she will “go to ministers” if the industry is not quick to reduce the promotion of “products that people don’t need”. What, I wonder, are these "products that people don't need"? I spend a lot of money on things that I don't need. They're the ones I like best. Thanks to the miracle of consumer capitalism I can buy lots of things that I don't "need" so why should the people who sell these wonderful products be prevented from promoting them? (Incidentally, if I was in such a perilous situation of near-starvation that I could only afford what I needed, I would be wise to spend my money on energy-dense food, but that's another matter). Look, Britain wasn't designed for unelected cranks to decide what the public needs and ban everything else. A shop is the property of the shopkeeper and he'll lay it out any way he damn well pleases. If you find that intolerable, I suggest you move to a country that is more to your likely. Saudi Arabia, for example, or Cuba. Ah, the famous "voluntary agreement" with government. Imagine mugging somebody with the words "If you don't give me your wallet voluntarily, I'll force you to give it to me". Do you this would be a legitimate defence if you were accused of robbery? It would not. But when the government does it, it's okay. Threats with menaces are fine if you work for the state. ...on what she described as “an area that lends itself to legislation”. I don't know Ms. Jebb personally but I doubt that there are many areas that she doesn't think "lend themselves to legislation". And yet, what democratic mandate does she, a "professor of Diet and Population Health", have to bring it about? Surely she is a mere hired hand, a sympathetic academic, not an elected politician? Indeed she is, but she has been seconded to the Department of Health which, as we have seen, is run by ideological bureaucrats who effectively make laws under the shabby umbrella of 'public health'. So she probably has a good chance. The move could force convenience stores to remove countertop units and obliterate the opportunity for impulse purchasing in smaller stores, costing retailers thousands of pounds. A small price to pay to temporarily satiate the whims of Public Health. A step in the right direction if we are to give the people of England "not what they want but what they need" (as that terrible old puritan Oliver Cromwell put it). Put the tasty snacks behind shutters, put them in plain packaging! Won't somebody please, for God's sake, think of the children? Oxford University professor Jebb is understood to be frustrated that, despite three years of group meetings, there has been no consistent progress towards removing promotions in shops, while reductions on salt and sugar have moved forward. Despite all those meetings! The poor woman went all those meetings and the yet the government still hasn't banned chocolate advertising! It's a scandal, dear reader. What is the point of sending jumped up academics to meetings if the government doesn't bow down to them? It's so unfair! Clearly, this an "area for legislation". Despite praising moves from Tesco and Lidl to remove confectionery from the till-point, she is keen for more action. People like her are always keen for more action. The crusade of the curtain-twitching, chocolate-fearing busy-body never ends. There's no point trying to appease them. They think they know what people "need" and what they don't "need". Take away their state funding and throw them out on the street where they can return to their natural calling of howling at passers-by. Don't feather their nests. Burn their nests, smash their eggs, kick them out of public life. The lot of them. With the Campaign for Real Ale (CAMRA) calling for more government intervention to save the British pub, let's remember what they said on the eve of the smoking ban in 2007. You'd think that the influx of "840,000 people who never go to pubs", combined with six million pubgoers going more often, would have been a real shot in the arm for the pub industry, wouldn't you? Alas, these people didn't exist (it's that old stated preferences versus revealed preferences thing) and 2007 saw the start of the biggest decline in pub numbers in living memory, possibly ever. CAMRA's new plan is to make it more difficult to turn a pub into a house or a shop. This won't stop pubs closing—it fails to deal with the underlying lack of demand for smokefree boozers—but it will mean that we can look at pubs in a derelict state for a bit longer while Tesco gets planning permission. So that'll be nice. 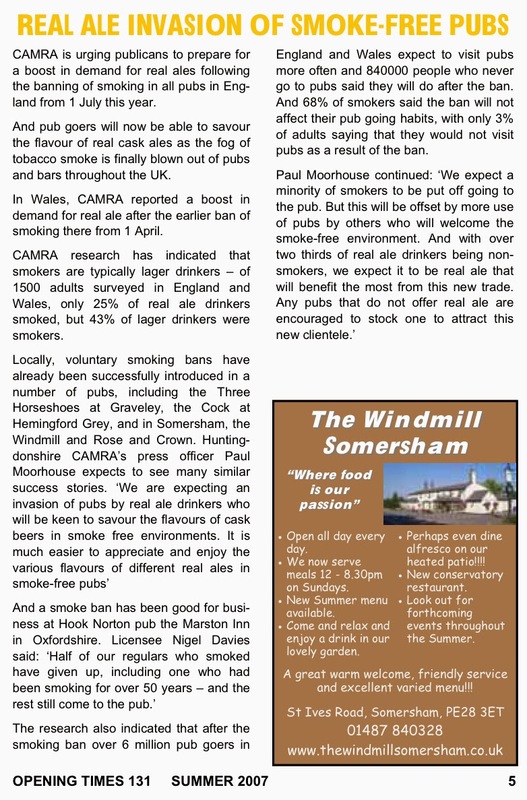 After supporting the smoking ban, and having said barely a peep about it since, CAMRA's campaign to save the British pub with more state regulation looks like being about as successful as its campaign to rid the country of lager and metal kegs. Further to yesterday's post about health warnings on alcohol, I was on Channel 5 News last night debating the idea with Lord Brooke. His lordship took the unusual tack of talking mainly about sugar and obesity. As it happens, I am not against having calorie labelling on alcoholic drinks, as he would like, but we don't agree on much else. 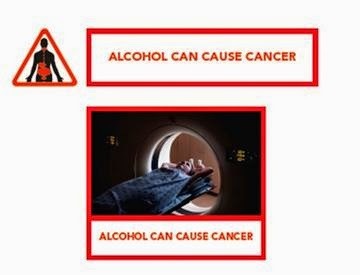 The news today that the All-Party Parliamentary Group on Alcohol Misuse wants health warnings on alcohol will come as no surprise to those of you who read last month's post about the Alcohol Health Alliance's ten point temperance manifesto. As ever when the state is lobbying itself, it's difficult to see where the politicians end and faux civil society begins. Alcohol Concern's new CEO, Jackie Ballard—who has been on the political / third sector gravy train for years—epitomises this. She was on the BBC this morning to give her support to the APPG's idea ("they have said..." "the MPs describe it as a pandemic..." etc. ), but it was not the APPG's idea. It was the Alcohol Health Alliance's idea and Alcohol Concern is a leading member of the Alcohol Health Alliance. The APPG is merely the mouthpiece of these organisations—most of whom are state-funded—in parliament. And we know that the next step is a 'day of action' in September. 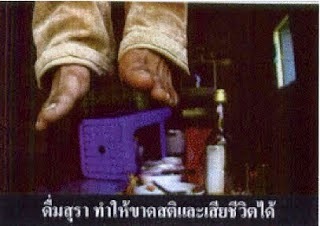 And Eurocare's is mild compared to the warnings that the Thai government wanted to introduce (they were only stopped by a trade dispute that was led—ironically—by Australia). The APPG/Alcohol Health Alliance will say that they just want to provide people with information, but they are free to do that without co-opting private property. 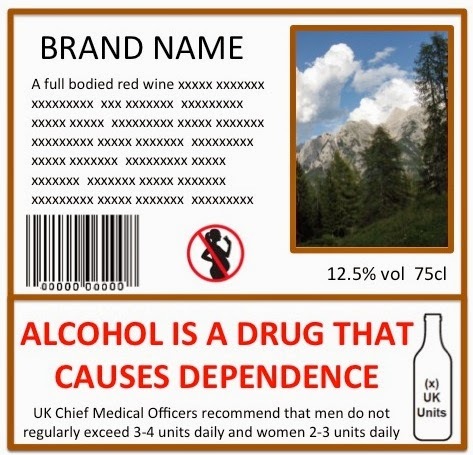 Considering the temperance lobby's addiction to misinformation—such as the claims heard today that "alcohol is the second biggest preventable killer" and "costs Britain £21 billion a year"—it is doubtful that their health warnings would be grounded in sound science. 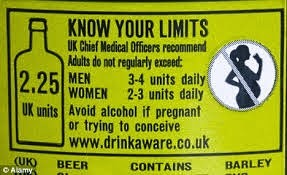 Indeed, even the current health warnings which say that it is unsafe to drink more than 2-4 units a day and that pregnant women shouldn't drink at all are not evidence-based. As with cigarette warnings, the intention is not to provide information (information which is, in any case, widely known) but to deter purchase. 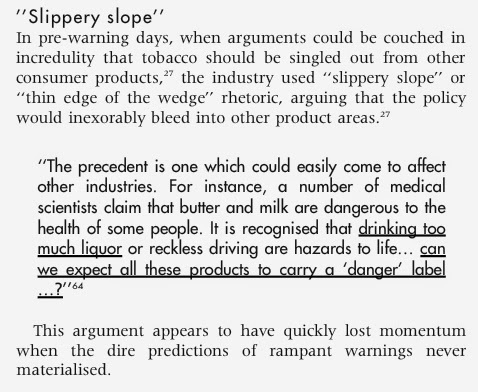 As with cigarette warnings, the aim is to demonise the product and stigmatise the user. Why else would they want to take up "at least a third of every product label"? Why else would they want gruesome images? We have no reason whatsoever to assume good faith from the temperance lobby. On the contrary, we know exactly what template they are working from and we have every reason to believe that they see bigger warnings not as an end in itself but as a stepping stone from which they can take "the next logical step". I was interested to see that Gerard Hastings has come to the attention of Peter Oborne at the Telegraph. In particular, I was pleased to see that he has watched the extraordinary "anti-business rant" Hastings gave recently and which I wrote about back in May. Rarely has it been more obvious that 'public health' is a offshoot of the loony left. If you haven't watched it yet, please do. As Oborne says, Hastings "looks and sounds to me much more like a political campaigner than a neutral, independent expert." And so he is, but if you think that Hastings is a fringe nutter, you're only half-right. He is not on the fringes of the public health scam. 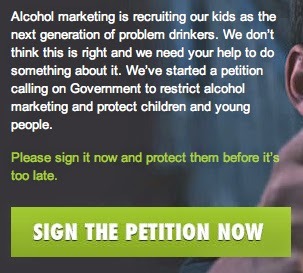 He is the lead author of the WHO's review of the impact of food advertising on children, he is the lead author of the UK government's review of the plain packaging evidence and he is the lead author of a review on the impact of alcohol marketing on young people. In each and every case, he departs from the economic evidence and portrays marketing as extremely powerful and deeply pernicious. This is hardly surprising considering his virulent anti-market political beliefs, but these beliefs are not unusual in the world of public health. They are quite typical. I watched the YouTube video of Professor Gerard Hastings embedded in the text. It was one long emotional rant (he seemed like he was about to burst into tears) against not just smoking and drinking and fatty food, but against marketing, big business, inequality, profit, everything. Here was someone who had looked at the world around him and did not like it one bit, and desperately wanted to make it into a better world. He wanted to completely reconstruct it. For him, public health was not just about smoking and drinking and fatty food: it was about absolutely everything, and he wanted Public Health to be running absolutely everything. For more on Hastings, see here and here. Further to yesterday's post about Public Health England openly campaigning for policy on a government website, it seems that the Department of Health's website is available to any private interest group that wants to run a political campaign—so long as the campaign supports the nanny state. The DoH is currently hosting this article by the Policy Officer of the British Heart Foundation (what self-respecting charity can get by without a policy officer?). 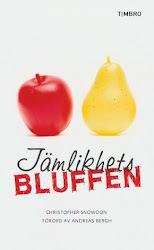 The article is introduced as being "about childhood obesity and media responsibility". In fact, it is a blatant advocacy piece for banning a wide range of food and soft drinks before 9pm (the argument is, inevitably, think of the chiiiildren). The article ends with a call to sign a petition on the BHF website. The petition reads: "You have the power to make change happen. Call on the UK Government to close down loopholes that allow adverts for unhealthy food and drinks on TV before 9pm and junk food to be marketed to children online." But hang on, isn't the Department of Health part of "the UK Government"? Well, up to a point, but as I have said before, the DoH is a law unto itself. It is staffed by bureaucrats who take a very different view of lifestyle issues to the elected government. It is not government policy to ban 'junk food' ads before 9 pm, but it is clearly a policy favoured by the DoH, hence the use of a public website to support a private campaign. Similarly, minimum pricing is not government policy, but that does not stop the DoH funding various sock puppet organisations to lobby for it (eg. this lot). Nor is a ban on alcohol marketing government policy, but that does not stop Balance North East using taxpayers' money to campaign for it. When it comes to the sock puppet state, the DoH is in a league of its own. It spends literally millions of pounds campaigning for illiberal policies and when the government announces a public consultation it is the DoH that becomes judge, jury and executioner. I know I go on about this a lot and I will continue to go on about it until there is some sign that the government is getting to grips with this absurd, wasteful and corrupt use of taxpayers' money. The Department of Health's sock puppet quango Public Health England has published its response to the Department of Health's plain packaging consultation. Guess what? It supports the policy! Who would have thought? State-funded self-lobbying really doesn't get any more shameless than this. As if to rub the taxpayer's nose in it, PHE has even published its response on the same government website that is hosting the consultation. 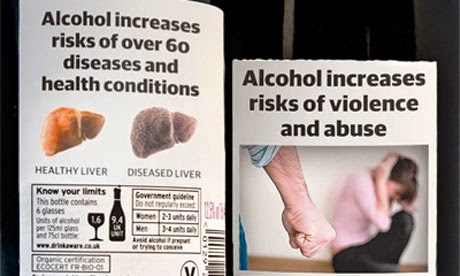 See if you can spot the difference between the government 'seeking views' on plain packaging and the 'independent' agency offering its strong support. The response itself is the usual bilge. 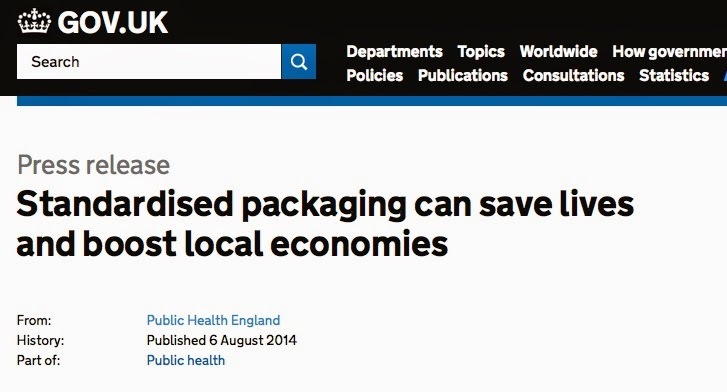 After dishonestly claiming that plain packaging led to a 3.4 per cent decline in tobacco sales in its first year in Australia (a massive lie, as regular readers know), Public Health England bizarrely claims that the same decline would create savings of £500 million in the UK. This suggests that smoking costs £14.7 billion a year—a figure that I have never heard mentioned by the even the least scrupulous anti-smoking campaigner. Retailers earn relatively little profit from tobacco sales. On average, only 7 to 9% of the cost of tobacco is retained by the retailer, compared to 20 to 30% for food and drink products. Public Health England neglects to mention the fact that 80 per cent of the price of a pack of cigarettes goes to the government in duty and VAT. Some of this money is then used to set up pointless and vastly expensive propaganda outfits like Public Health England who cry crocodile tears over the cost of tobacco on a government website while calling for the government to be given more power. Presumably PHE decided not to mention the 80 per cent tax take because its faux concern about money being sucked out of "areas of social deprivation" would be taken less seriously if people were reminded that it is their paymasters in government who are doing the looting. Wise move, really. Arguably the best reason to stop smoking is that it prevents the state getting its paws on more of your hard earned money. Alternatively, you can continue smoking whilst buying your cigarettes abroad or on the black market which is, of course, what people will do if this ridiculous policy is introduced. Do you have any observations about the report of the Chantler Review that you wish to bring to our attention? Chantler is not qualified to review a complex issue that extends beyond his immediate sphere of competence, is significantly and obviously biased and ignores evidence that contradicts his clearly partisan view. I have absolutely no confidence whatsoever in him. Subsequent to the review he has appeared on the BBC programme Burning Desires and demonstrated ignorance on the economics of smoking and its cost to the NHS. The Chantler review has a very narrow focus and is not objective. The DH runs the risk of being accused of misleading the public again if it continues to cherry pick evidence to suit ideologically preferred policies. Do you have any information, in particular any new or additional information since the 2012 consultation, relating to the wider aspects of standardised packaging that you wish to bring to our attention? Dr Ashok Kaul and Dr Michael Wolf have analysed the impact of plain packaging to date on Australian youth smoking rates. The negative conclusions arrived at by highly qualified statisticians using data from a hopefully unimpeachable source have been ignored by the DH and Chantler in favour of weak data based on psychological models produced in many cases by people with a history of anti-tobacco and anti-industry activism. Figures released by the Australian government show an increase in youth smoking of around 36% between 2010 and 2013. This data set includes a significant period after the packaging intervention in Australia. The data is not especially strong as it is based on a household survey but it is more robust than the public health estimates and assumptions that have been used to make the case for plain packaging. To my knowledge, no hard data has been released on the growth of the illicit trade in Australia post intervention but anecdotal evidence courtesy of a national news broadcaster suggests that it is significant and Australian authorities are blaming the increase on the packaging legislation. Further anecdotal evidence has circulated in the media suggesting that despite the airy assurances of tobacco control, those who produce and sell illicit tobacco products view the prospect of plain packaging as very positive in terms of their business potential. A great number of people and UK enforcement organisations agree with them and the DH would be failing in its duty if it ignores this argument and the attempts to deflect it through unpleasant ad hominem attacks by the tobacco control lobby. Do you have any comments on the draft regulations, including anything you want to draw to our attention on the practicalities of implementing the regulations as drafted? As I completely disagree with this proposed legislation I can think of no way of improving it. 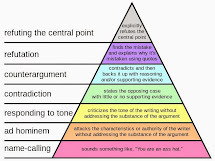 Bearing in mind the psychobabble from the public health industry, the DH might want to consider the intellectual merits of an argument that seems to be based on a philosophy of reinforcing failure by shouting more loudly. The argument making warnings bigger, more noticeable and more graphic for example assumes that the current ones are having no impact because despite covering half the packs they are passing unnoticed. That is an utterly asinine notion that speaks volumes about the intellect of public health activists and their contempt for the intelligence of consumers. Personally speaking, if I were in government, I would be embarassed to be associated with such introspection, arrogance and intellectual incapacity. Are you aware of any further evidence or information which would improve the assumptions or estimates we have made in the consultation-stage impact assessment? The impact assessment as it stands is utterly unsound, extremely subjective and untrustworthy. I have rarely read anything so overtly biased in favour of a policy and had I produced anything quite so lacking in objectivity within a commercial environment I would have rightly expected to be dismissed. I would expect standards in government to be even higher than those in industry but am often disappointed. Throughout, the assessment relies on frequently nebulous poor quality research produced by self-styled public health experts. I contest that there is no such thing as a public health expert and question the objectivity of people who are producing evidence that supports policies that they are simultaneously lobbying for. The impact assessment relies heavily on Pechey et al 2013 to calculate potential impacts of the policy on smoking rates. Pechey et al were directly funded by the DH which is not good. However, what they produced is I am sure absolutely fine based on the evidence that they had. It is there that the problem lies. Pechey admits that their findings are based on subjective data produced by “experts”. I argue that however robust the Pechey methodology the fact is that the data it is based on is unreliable due to blatant author bias. A number of the authors involved are openly anti-industry or anti-tobacco and it is hard to imagine how they could possibly be objective about policies that they have campaigned for. The source data is unsafe and almost certainly heavily biased. I am not alone in believing that the DH has hugely underestimated the potential effects on illicit trade and has been less than thorough in its assessment of the impact on SMBs. The assumption that loss in tobacco income for SMBs will be made up for by purchase of other goods for example is pure hypothesis that ignores for example the very real possibility that the other goods may be purchased elsewhere. The DH appears to have largely ignored the tobacco industry and for that matter virtually every other commercial source in performing its assessment. Favouring the views of Cyril Chantler over KPMG in a commercial context is an example of the lack of credibility that this introduces. Over reliance on sources such as the BMA, CRUK and The RCP is unsafe as none of these are expert bodies and all have vested interests. The BMA for example is a medical trade union and what it has to say about smoking uptake is inexpert and irrelevant. The RCP document referenced re the costs to the NHS of SHS impact on children relies entirely on multi layered estimates based on largely unjustifiable assumptions. It is not an expert analysis is not objective and has never been reviewed impartially. It is one of the most scientifically ridiculous documents I have ever read. The most significantly flawed aspect of the impact assessment is the calculation of health benefits, which appears to be based on fantasy numbers that fail to take into account societal costs. No justification is provided for the figure of £60,000 per person year of extra longevity the policy might produce and it is hard to understand what possesses the DH to believe it can accurately monetise extra years of life, especially when quality of life cannot be taken into account. It is illogical to apply a fixed figure to longevity benefits that will obviously depend on age and state of health. If the DH insists on subjectively monetising longevity then it should at least distinguish between extra years gained for example for a productive 25 year old versus those gained for a 70 year old in poor health. The only legitimate costs/benefit analysis within the context of a consultation such as this is a societal one in which the value of the extra years is calculated based on their contribution to society and offset by costs to society. Numerous studies have been performed in this area and the majority find that additional costs to society associated with risky behaviours such as smoking are more than offset by benefits such as fewer years in ill health, reduced pension provision etc. This is particularly true of smoking which has health impacts later in life when a person is more likely to be a beneficiary rather than a contributor to society. The societal cost argument might be ethically challenging for the DH but does have the benefits of being quantifiable and being honest, two virtues sorely lacking in the current DH analysis. The DH may not like it but the evidence strongly supports the notion that smokers save society costs by dying young and relatively quickly. That does not mean that as a society, we should encourage smoking but failing to account for this in a financial analysis is unsound and could be construed as dishonest. A major cost of the proposed intervention that the impact analysis fails to take into account is the time and money the DH will waste on future similar consultations should the anti-tobacco lobby be successful. The proposed legislation will be seen as a green light for every pressure group to campaign for similar measures against whatever industry it particularly dislikes. The potential costs are very significant. The impact assessment as it stands is not sound, not objective and is not remotely credible. No legislation should ever be enacted based on work of such quality. The consultation closes at 11.45 pm tomorrow (Thursday) so there's still time to give the government a piece of your mind. The details are here and you can send your e-mail to tobaccopackaging@dh.gsi.gov.uk. What on earth does that mean? Affected how? "Our research shows that an MUP set at 50p per unit would affect the liver patients killing themselves with cheap alcohol 200 times more than low risk drinkers." Still puzzled, I went to look at the study in question (of which Sheron is the lead author) and found that being "affected" 200 times actually means that very heavy drinkers will have to pay 200 times more than very light drinkers. We found that an MUP of 50p/unit impacted most severely on harmful heavy drinkers, who, on average, would have to pay an additional £1,500/year, or 13% of their income, compared with £4/year, or 0.03% of income, for low-risk drinkers. Jeez, kick 'em while they're down, won't you Sheron? It appears that taking money from alcoholics is now considered to be its own reward in the warped world of pretend public health. Note that this 'study' makes no attempt to estimate the extent to which 'harmful heavy drinkers' will reduce their alcohol intake as a result of this regressive policy. It is no more than a back of the envelope calculation that anyone could do given the quantity of alcohol purchased by each group and the average price paid. It's not even a very good back-of-the-envelope calculation. Sheron has borrowed a trick from the Sheffield mob by using an extremely stingy definition of a moderate drinker. In this study, a 'low-risk' drinker is someone who consumes just six units a week (that's a little over two pints of lager) and who spends £1.10 per unit (ie. buys all their alcohol in a pub). As a result of this massively unrealistic definition, Sheron says in the press release that minimum pricing "leaves moderate drinkers completely unaffected." The man is a shameless knave. It is quite obvious that minimum pricing will penalise those who (a) buy cheap alcohol and (b) buy lots of alcohol. Clearly, it will "affect" (read: "rob") them more than it will "affect" (read: "rob") people who (a) buy expensive alcohol and (b) buy hardly any alcohol. It is sad, but typical, of a medical journal to publish such an inane, policy-driven article and equally sad and typical that it was promoted with a meaningless and crumby press release. The ever-excellent Tim Worstall has more on this pitiful rubbish. I mentioned in May that the British Medical Journal had issued corrections to two articles, one of which was written by Aseem Malhotra, and had also set up an expert panel to decide whether the articles should be retracted altogether. Malhotra article was about saturated fat, statins and heart disease. Malhotra portrayed the former as being largely irrelevant (indeed, he called sat fats 'protective') while portraying statins are virtually useless and frequently dangerous. Sat fats have probably been wrongly demonised (sceptics have been saying this for decades despite the medical establishment's consensus) and statins are probably over-prescribed. Malhotra's basic conclusions were therefore fairly sensible by his standards but, as usual, he overcooked his argument by exaggerating and cherry-picking evidence. In particular, he relied on one weak, uncontrolled study to make the claim that 20 per cent of statin users experience 'unacceptable' side effects. This is what led to the BMJ's correction and investigation. The panel has now decided that the article should not be retracted. This seems to me to be a reasonable decision. It was, after all, only an opinion piece. If journals retracted every article that cited a questionable piece of research there wouldn't be much left. Hi Rebecca, I am in the final stages of a potentially game changing and much needed piece busting the myth of saturated fat and heart disease. It is well referenced including a strong evidence base for why all calories are not the same and I also briefly question statins in primary prevention and provide an explanation why the evidence is weak for benefit here. This is something I have conceived and looked into for over a year now. I can and was planning to do it for the Observations column but it's close to 1600 words and thought it may be more suitable as a feature? But I don't know what your requirements/usual process is for feature pieces? I have a heads up that the WHO is going to announce a revision on dietary guidelines on sugar at the end of October and the Scientific advisory committee on nutrition is currently reviewing dietary guidelines on carbs. But I am not confident that they will be totally impartial as one of their lead scientists has recently been exposed as being on the pay roll of Coca Cola! I therefore ideally want to publish this in the next few weeks but if it is not something you see as viable for features then I would shorten it down and do it for Observations but just thought it was worth asking you first! Firstly, note the title of the e-mail. It reveals that the BMJ had previously asked this guy to be a peer reviewer. Of what, we don't know, but let's hope it didn't have anything to do with diet, sugar or obesity, as Malhotra has a long track record of getting the facts hopelessly wrong. Malhotra's previous contributions to the BMJ had been generic rants about sugar and 'junk food' so it is odd that the journal should have considered him to have any particular expertise other than as a rank-and-file medic. Secondly, note the delusions of grandeur ("game changing", "busting the myth"). Malhotra's 'myth-busting' is not news to anyone who is familiar with the literature, including the popular literature. James Lefanu, for example, explained it much better in The Rise and Fall of Modern Medicine (1999). Thirdly, note the motivation for the article which Malhotra openly gives the BMJ. He's in a rush to get it published because he had a "heads up that the WHO is going to announce a revision on dietary guidelines on sugar at the end of October and the Scientific advisory committee on nutrition is currently reviewing dietary guidelines on carbs." The article is therefore explicitly policy-based, as he confirms a few days later once he has been passed on to the journal's deputy editor, Trevor Jackson. I also wanted to give you a heads up and check that it's ok that I'll be submitting an Observations piece in the next couple of days that I've been putting together for some time. I am just editing it down from 1600 words. It essentially busts the myth of saturated fat and heart disease, why all calories are not the same and also seriously questions statins for primary prevention. It's provocative and timely with the SACN currently reviewing their advice on carbs but as Sarah Bosely has recently exposed a leading scientist on the board has been co-opted by Coca Cola. Don't worry there's nothing potentially libelous this time! Potentially libelous? I wonder what the story is there. I believe it will definitely trigger a debate. I know this is very short notice but do you think there's possibly space time for next week's October 12th issue? It's partly because I think we'll be ahead of the game before the WHO make an announcement on sugar at the end of October but also I happen to be off next week in case the press are interested. They do not. Instead, they immediately commission the article which Malhotra sends over the following day. 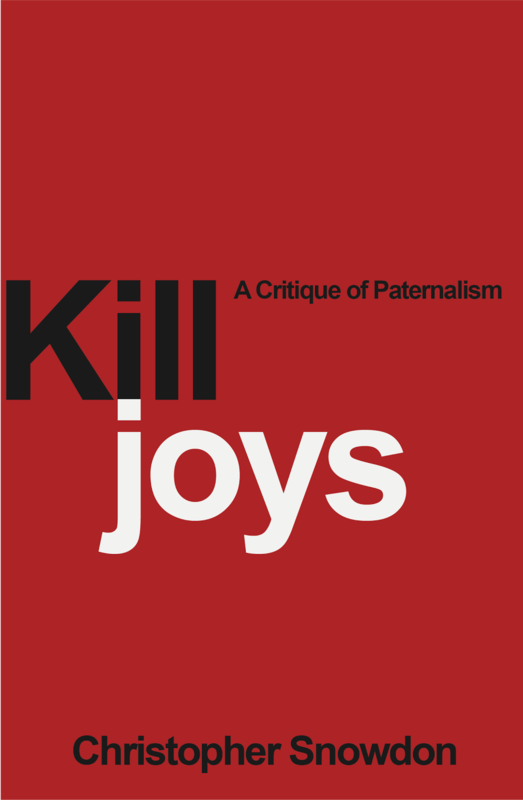 Jackson tells Malhotra that he "really likes it" and mentions that the editor-in-chief, Fiona Godlee, is "particularly interested in this subject". Hope you're well! Am I correct in presuming you've not heard back from the reviewers yet? Yes, that's correct. One reviewer denied, one said he couldn't go it until November, but I am expecting the third ASAP. Today, I hope. I am keen to include your piece in 26 Sept [sic - he means 26 Oct.] issue, and there is plenty of time for that, but Fiona is keen that all pieces like yours are externally peer reviewed, and I agree with her. Thanks Trevor, I am also happy that the piece is peer reviewed also. Better not to give any ammunition to detractors with vested interests! Despite waiting for the reviewer's comments, Malhotra immediately starts planning his media assault. Just to let you know that BBC Breakfast have pencilled me in to discuss busting the myth of saturated fat/heart disease for next wednesday morning. I have taken the day off as annual leave. I hope that yourself and Emma will be happy to press release (I can chat to her directly as I know you've got plenty on your plate to do!) early next week if we don't get a response till Monday from the peer reviewer. I am sorry if I appear over indulgent but for such an interesting and important public health message it would be fantastic opportunity to spread the message and maximise impact. After a poke from the BMJ, John Abramson sends his comments over and the BMJ forwards them to Malhotra, giving him the name of the reviewer. Abramson also knows the identity of the author (ie. it wasn't a blind, let alone a double-blind, peer review). Abramson has a much better grasp of the science than Malhotra but he was unlikely to be very critical of the article since he also believes that statins are heavily over-prescribed and have serious side effects. Nevertheless, he offers several suggestions and corrections, most of which Malhotra ignores. Malhotra gets the comments at 10.11pm and sends the final draft to the BMJ at 5.14am the following day. He does nothing more than change one statistic and a handful of words. When Abramson describes one of Malhotra's assertions as "a stretch... a weak and tangential argument", Malhotra responds to the BMJ saying "Just his opinion - no change". Elsewhere, when Malhotra portrays a controversial theory as a fact, Abramson says "This is one theory about the mechanism of benefit, but certainly not proven" to which Malhotra simply replies "He agrees it's a theory - No change". Although Abramson makes some substantive criticisms, he does not pick up on the dodgy reference which led to the retraction that got Malhotra in hot water. This is not surprising. Remember that Malhotra's article was one of two papers from the October 26th issue to be flagged up with a correction and be investigated by an expert panel. Both articles claimed that 20 per cent of statin users suffered serious side effects and they both cited the same study. And who was the lead author of the other study? Step forward John Abramson. So here we have two peer-reviewed articles, both of which have caused the BMJ some embarrassment. At least one of the articles was reviewed by the author of the other and by no one else. This reviewer was known by the BMJ to be someone who agreed with Malhotra's argument but even if he hadn't it would scarcely have mattered since the BMJ clearly doesn't expect its authors to take heed of what reviewers say anyway. Both Malhotra and the BMJ were more focused on having the articles rushed out so that they could influence policy and make a splash in the media. Which, of course, they did.